What’s the best tankless water heater for your whole house? Well, we’ll discuss in detail the Stiebel Eltron Tempra Plus and the EcoSmart Eco electric tankless water heaters. But first we need to lay down the groundwork and give you some context so you can make the right decision for your particular needs and budget. We all have our own unique set of circumstances that we have to consider when making a buying decision; which is why we always provide options and alternatives in our articles. Sometimes you might not be able to afford the ‘best of‘ something, and that’s okay. But if you’re reading this then I can safely assume you are trying to figure out some options when it comes to electric whole house tankless water heaters. Am I right? When I was a kid our home had a traditional tank system water heater. Most people did, and to be honest, the majority of people still do. Sometimes people are slow to adapt new technology. It took a long time for society to switch from horse-drawn carriages to automobiles. The truth is that tankless water heaters are far superior to tank water heaters. Plain and simple, and I always to enlighten our readers with tools, power equipment and information that will genuinely help them make smarter decisions. Yes, I’m talking to you. Video | How does the EcoSmart Eco 27 Work? ✓ Did you know? EcoSmart electric tankless water heaters are 90% smaller than a conventional tank-based heater, allowing you to easily find a space for them anywhere in your house. Having access to hot water straight from the faucet is one of the many convenient innovations that we have technology to thank for. The best tankless water heater systems add even greater convenience and savings for the modern home! Could you imagine living in a time period where you would have to boil water over a wood-burning stove just to take a bath!? Thanks to the introduction of domestic water heating systems, we can have hot water right when we need it without resorting to medieval methods. Hot water has many uses around the home from the kitchen to the bathroom. For effective dishwashing we rely on hot water to cut through grease and grime more easily as well as a method for sanitation. For heavily soiled laundry hot water is best for washing to get your clothes and linens clean and good as new. Let’s not forget that it’s also a must for more comfortable showers and relaxing baths to melt away the stresses of the day. German engineered and manufactured. Excellent quality. Highly reliable. Hot water is a necessity in every household and there are different methods for acquiring it through your home’s water supply. A tankless water heater can provide your home with hot water on demand with many advantages over conventional water heater systems. With a rising concern on our energy consumption and the impact it has on the environment many technological advances have allowed us to make better use of the energy we consume. Video | Why Buy An Electric Tankless Water Heater? *The EcoSmart Eco series is shown in the video below. It’s great to see Amazon producing these high-quality and informative videos for customers. Many products don’t require videos but waterless tank heaters — like the EcoSmart Eco series — are fairly sophisticated and watching a video will help you understand how they work and the benefits associated with them. As you’ll see, we’ve included a lot of videos in this article. We hope you take the time to watch them. It’s for your own benefit. The more you know the more likely it is that you’ll spend your money wisely. You are likely familiar with the typical water heater systems that are found in most homes, which consist of a storage tank that is designed to heat up water and store it for use. These types of systems use an energy source such as natural gas, propane, electricity, or solar energy to heat up water continuously. A tankless water heater is sometimes referred to as an ‘on demand’ water heater system because it heats up water through coils as you need it rather than storing a tank of water that remains heated. A tankless unit is about the size of a suitcase, some smaller, and it consists of either a gas burner or electric heating elements depending on the type. It heats up cold water as it passes through the heating element and delivers hot water at the tap. Tankless units heat up water when there is a demand for it and will continuously heat the water for as long as the tap is running. This means never running out of hot water for your shower! One thing homeowners need to understand if considering the switch to tankless is the nature in how these units work. Whole house units slightly reduce the water flow as it splits up the demand for the water across separate lines to different points throughout the home. They are capable of delivering hot water at an average rate of 2 to 5 gallons per minute. The best tankless water heater benefit to conventional models is an unlimited supply of hot water. Energy-efficiency comes in at second. While other systems continuously heat the water that is stored for use, a tankless system is on-demand and will only heat up the water you need. This helps homeowners save money to cut back on their utility bills; a considerable factor when you take into account that water heating makes up 14-18 percent of your utility bills. Your water bill may drop as well as a result of the reduction in flow per minute. The advantages of a tankless system are impossible to ignore. Tankless systems also take significantly less space than the tank-types. In fact, certain smaller model electric units like some of those we’ll mention can even be installed under cabinets or in a closet due to their compact design. Additionally, because these models don’t have a large tank filled with water being stored you don’t have the risk of flooding that can occur from a ruptured tank. This just so happens to be one of the 5 top causes for water damage in a residential home as a result of corrosion and rust that can occur over time! Tankless systems carry longevity and can last nearly twice as long as tank heaters. Under the right circumstances, meaning they are regularly serviced as suggested by the manufacturer, a tankless system could last a homeowner for around 15 to 20 years or longer. Storage tank water heaters generally need to be replaced after 10 years. The following models are structurally the same: ECO 18, 24, 27 and 36. These systems do have a few drawbacks. For one, they are more expensive in upfront costs compared to tank-type models. This is because they are much more complex in design and can be harder to install than standard water tank heaters when being retrofitted to a home that previously contained a storage water tank. If you’re replacing a current water tank with a tankless system in your home you will also have additional expenses for the required upgrades that are involved. Since tankless units are designed to heat up water on demand, there is a longer lag time for the hot water to come through. With a storage tank the hot water is waiting for use so when you turn the tap on it’s hot almost instantly, depending on distance from the tank to the source. A tankless unit delivers hot water continuously once activated, but the process in which the water goes through to be heated can take 10 to 15 seconds. A federal tax rebate of $300 is offered with many tankless water heater systems. Electric whole house models are much cheaper overall than gas whole house tankless units. An electric unit is found more energy efficient at saving you money in the long run. One of the benefits that gas-fired tankless systems have over their electric counterparts is a higher flow rate. They heat up water faster than electric systems so there’s less lag time and are more capable of meeting higher demands at the set temperature. Although they are more efficient at providing hot water, they’re less efficient where energy consumption is concerned. The pilot light in a gas-fired tankless unit must burn continuously, which is a waste of energy. Indoor tankless model using natural gas instead of electricity. If your home is setup for gas then this Rinnai model (series) is excellent. Read our in-depth article if you want to learn more about the Rinnai Ultra Series. ✓ Visit Amazon to purchase your EcoSmart Eco electric tankless water heater. Each household has specific needs when it comes to their hot water usage. Factors like the size of the home and household will play a major part in choosing the best tankless water heater that meets your daily usage of hot water. The temperature of the groundwater is another important aspect not to be overlooked. The heating capacity of tankless systems is based on flow rates and temperature rise – that is the difference of the groundwater temperature to the temperature your water heater thermostat is set at. The cooler the water temperature is, the greater the temperature rise will need to be of the tankless unit to adequately heat the water at a desirable flow rate. Stiebel Eltron Tempra/Tempra Plus flow rate. In terms of whole house tankless water heaters, you will often see the unit ‘gallons per minute’ or GPM referring to the rate at which the water flows from the source. The GPM (gallon per minute) rate is very useful when you’re looking at water heaters to estimate about how long it would take to fill a bathtub or jacuzzi with hot water. Different appliances throughout the home may feature their GPM rating on the manufacturer’s tag or label. If you can’t locate it here’s a simple way to better comprehend those measurements when you’re reading a manufacturer’s claim that promises hot water at a rate of 1.5 gallons per minute. Your standard bathroom sink has average flow rates from 0.5 to 1.5 gallons per minute. There have been many manufacturers of tankless systems which failed to meet the expectations these systems promised. When tankless water heater units were first introduced some of the common issues new owners experienced were difficult installations, inconsistency in water temperatures and maintenance. Two major brands that stand out in a sea of manufacturers and contenders for the best tankless water heater systems are Stiebel Eltron and EcoSmart. These companies have stuck through their commitment to get past those early hiccups with promising products that meet your needs. Stiebel Eltron is certainly no newcomer to the industry of tankless water heaters. The company has decades of experience and technological advances in manufacturing some of the best whole house tankless water heaters by addressing common issues. One of the drawbacks known to tankless water systems is the inability to maintain hot water temperatures when running at high demand. The company has been around for a long time. You’re in good hands. For instance, if someone were taking a shower while the dishwasher was running the higher demand would surely be too great for the system to handle. Because the water is distributed to multiple sources, even larger capacity whole house tankless systems were unable to maintain the temperature and cold spots would occur as the water was being heated. It’s a problem that even standard storage water tanks are not blind to – when the demand for hot water is high the hot water that’s been stored runs out sooner and often leads to those cold surprises in the shower. The difference with a tankless system is that you don’t have to wait long for the hot water to return. Stiebel Eltron has managed to successfully overcome this setback with their line of Tempra PLUS whole house electric tankless water systems. The innovative design in Tempra Advanced Flow Control is to slightly reduce the water flow when a greater demand is put on the unit in order to maintain the set temperatures. So during periods of high demand there is always consistency with your hot water being at the right temperature; it just might take longer to run a bath. It is a feature that is exclusive to the Tempra PLUS line only. View or download the Sizing Guide Document. The Tempra Plus electric whole house models have various sizes to accommodate all household needs depending on size and geographical location. Because flow rates will vary based on how high the temperature rise is to adjust the incoming groundwater at the set temperature, climates are an important factor to consider. Valuable features you will find with all of these models include digital temperature control and full power modulation along with temperature regulation to ensure maximum set temps remain consistent. A dial selector on the front panel lets you set the temperature between 86° to 140° Fahrenheit. The wall mountable units also feature overheat protection. Innovative design and German engineering make this a definite winner. In case you are not aware, Stiebel Eltron has a series called “Tempra,” which is an inferior electric tankless water heater to the “Tempera Plus” series which we’re recommending here. But, it’s important that you are aware of it to avoid any confusion. The excerpt below explains what differentiates one series from the other. What’s the difference between Tempra Plus and the basic Tempra tankless water heaters? Tempra Plus models are equipped with Tempra Advanced Flow Control, which was invented by Stiebel Eltron. No other manufacturer of tankless electric water heaters has anything like it. If the demand is greater than the unit can handle, Tempra Advanced Flow Control slightly reduces the flow of water to maintain delivery of hot water at the set point. On-demand, continuous and unlimited supply of hot water. High limit switch with manual reset. All models equipped with exclusive Electronic Temperature Control that ensures steady output temperature even with varying flow rates. Exclusive design prevents dry firing. Electronic switch activated for virtually silent operation year leakage/3 year parts warranty. 7 year leakage/3 year parts warranty. Copper sheathed heating element housed in copper cylinder. Cold water only line needed to be run to lavatory Seismic proof construction. Tankless design prevents Legionella bacteria growth. No standby heat loss with tankless design. Easy installation ¾” NPT connections. Details on the Tempra Plus 36. This model is rated for high flow rates in households of the cooler Northern climates where average temperatures from the groundwater are around 40°F or even lower. For those living in warmer climates it can serve households with up to 4 bathrooms or an average flow rate of 5 to 5.5 gallons per minute at a 45°F temperature rise. It is one of the most powerful units on the market and rated for residential, commercial and industrial use. The recommended minimum of 300 total amp service for this 36kW unit will require 3 separate dedicated circuits of 50 Amps. For up to 3 bathrooms in warm climates, or 2-3 bathroom in cool climates. This model is suitable for the average sized home with 2 bathrooms for cooler climates or 2-3 bathrooms for households in warmer regions. This is assuming an average flow rate of 2 gallons per minute with a temperature rise above 65°F. It draws 120 amps with a recommended minimum amp service of 200 with 3 separate 40 Amp circuits and requires 240V or 208V to run. Have it installed professionally. Don’t do it yourself. For homes in the warmer regions with up to 2 bathrooms and cooler climate households with 1-2 bathrooms, this model is recommended for maintaining consistent temperature and flow rate. In a household with a 45°F temperature rise based on the set water heater temperature, the unit will provide an endless hot water supply at a rate of 3.5 – 4 gallons per minute. It is also suitable for commercial use. Save at least 15-20% on the hot water portion of your electric bill. In climate regions with cooler temperatures the Tempra 19.2 kW tankless unit is suitable for 1-bathroom households and 1-2 bathrooms for warmer climates. If the incoming groundwater is 45°F and you have the thermostat on your unit set to 110°F, this would give you a 65°F temperature rise; at which the flow rate would be 2 gallons per minute. Depending on how cold your winter gets this would be practical for smaller households or condos. It can also serve commercial or industrial use with a consistent flow rate of 2.5-3 gallons per minute at 45°F temperature rise. Replaces a conventional tank heater, yet takes up considerably less space. This model is a 14.4 kW unit that delivers an average flow rate of 2 to 2.5 gallons per minute at a 45°F rise. For warmer regions it will efficiently supply hot water in households with 1-1.5 bathrooms at a recommended minimum of 100 total amps, with 2 separate 30A circuits. It can serve 1-bathroom households in cooler climates; however more amperage may be required. In a home where the incoming groundwater is 45°F, it will supply hot water with a set temp of 110°F at a rate of 1.5 gallons per minute. It can also serve commercial and industrial use in warmer regions. This 12 kW tankless electric unit would be a considerable option for households in warmer climates with 1 bathroom and possibly even cooler climates with 1 bathroom for a cottage or cabin. If you’re looking for a reliable tankless unit that meets your budget this model will supply endless hot water at a rate of 2 gallons per minute with a temperature rise of 35°F to 40°F. It would not be recommended for households in climates where the incoming ground water gets below 55°F. Visit the Stiebel Eltron site to learn more. EcoSmart is another reputable manufacturer of whole house electric tankless water heaters that you can depend on. They are made with copper as well as stainless steel components to deliver safer and effective operation. Various parts like the heating elements are easy and affordable to replace to keep your unit running as it should. In addition to their longer lasting lifespan compared to storage water tanks, EcoSmart offers limited lifetime warranties on their products. These electric units are easy to install by having an electrician or professional contractor wire them directly to your home’s electrical panel. The digital thermostat can be set to your custom preference in 1° increments from 80°F to 140°F. The right size tankless system for your home will make all the difference to ensure you have the best tankless water heater so you never run out of hot water. These water heaters are designed with advanced technology to provide up to 50% savings on water heating by adjusting the energy consumption based on hot water usage. To achieve the optimal savings on energy usage and efficiency it is recommended to install low-flow or water-saver shower heads. Here’s a look at the full line of the EcoSmart whole house models to help determine the size that suits your household. PARTS DIAGRAMS — Find them HERE, (EcoSmart site). Can run four showers and two sinks simultaneously without running out of hot water. This 36 kW tankless unit is the suitable option for large households that need to run multiple applications at the same time. The largest model of the Ecosmart series, this unit is designed to handle high hot water demands even in cooler temperatures. In the northern regions where average incoming water temperatures are as low as 37°F, the unit can supply enough hot water sufficiently to a household with 2 running showers simultaneously at a rate of 3.6 gallons per minute. In the warmer regions with an average incoming water temperature of 72°F the unit can serve a household of 4-5 showers at 7.5 gallons per minute. Capacity to handle a large single-family home. 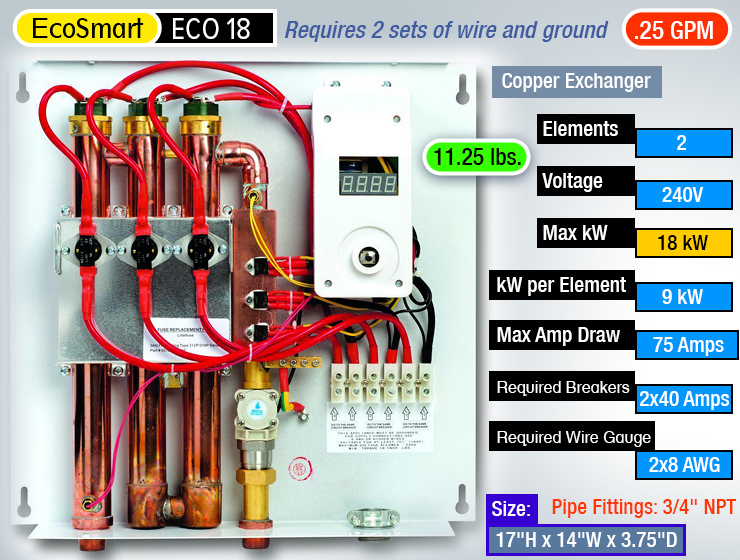 This EcoSmart unit is also sufficient for large single-family homes that have a high demand for hot water with multiple applications simultaneously in the cooler regions as well as warmer regions. A household with a jacuzzi tub, for instance, can enjoy a hot soak while still able to run a water-saver shower in regions with inlet water temperatures of 50°F or lower at a rate of 3.5 gallons per minute. It’s more than sufficient for homes in the warmer regions with incoming water temperatures above 70°F at an average rating of 6 gallons per minute. Designed for a medium to large single family home. A considerable tankless water heater for households with medium hot water demands, the 24 kW unit can supply hot water in areas where incoming water temps average around 50-55°F at a flow rate of 3.1 gallons per minute for two low flow showers. In climates with incoming water temps averaging around 65- to 70°F, the flow rate can sufficiently supply households with 2 to 3 hot showers at a rate of around 4.3 gallons per minute. Ideal for a large apartment/townhome with up to 3 people. The ECO 18 electric tankless water heater is suitable for smaller households such as an apartment or townhouse consisting of two bathrooms. It can supply hot water at a rate of 2.5 gallons per minute in climates with incoming water temps at 55°F. This will provide at least one shower and a low flow application such as a faucet to be used at the same time. In warmer regions it is sufficient at supplying hot water at a rate of 3.2 gallons per minute for two showers open full. Ideal for a small apartment, the ECO 11 can be used for multiple or single applications. This compact 13 kW water heater system is suitable for households in warm climates with 1 to 1.5 bathrooms to supply hot water at a rate of up to 3.2 gallons per minute. It is not recommended for households living in the northern regions. During cooler periods where incoming water is approximately 55°F it can supply hot water for 1 shower at a rate of 1.7 gallons per minute. The ECO 8 is ideal for a small apartment with up to 2 people. This smaller unit is capable of supplying hot water for 1 shower at a rate of 2 gallons per minute. While it is one of the smallest, it’s still sufficient to provide a small household of two people in warm climates with a temperature rise of 45°F for one hot water application at a time. It can also serve as a point-of-use unit to supplement a current system with additional hot water for a single appliance. If you have multiple bathrooms and high demands for hot water then you may want to consider an additional point-of-use unit in addition to your whole house system. These tankless water heater models are designed with the same technology as their whole house counterparts to adjust energy usage and supply unlimited hot water where you need it. This model is ideal for hand washing applications in cooler climates. This 5.5 kW point-of-use tankless water heater is a great addition to current systems as well as serve applications for commercial use and RVs for low flow applications like hand-washing. Its compact size is particularly designed for convenient under-the-sink application to provide instant hot water. This small unit draws an average of 25 amps of power and requires an electrical panel with a 100 total amp capacity. Can heat half a sink, but in warm climates, it can heat a sink and a half. This 4 lb. 3.5 kW water heater unit is just slightly smaller than the POU 6 unit to supply hot water for hand-washing applications in households, RVs and small commercial use such as doctor’s offices. Its small size is convenient for point-of-use applications and still capable of providing hot water at a flow rate of 0.5 gallons per minute. If you read the entire article you should have a much better idea if going tankless is right for you. Only you can decide if it’s the route you want to take but the benefits to buying a tankless water heater are fairly clear and practical. Many of the updated tankless water heater units have features and thoughtful qualities that make them easier to install than previously, but it’s still very important to have the job done by a professional. Not doing so could result in voiding your warranty on the model. A tankless electric water heater can be a great and effective way to ensure you and your family have plenty of hot water to go around. The energy savings you can benefit from owning one of the best tankless water heater systems over the conventional systems is an added plus to boot. We recommend installing a thermostatic mixing valve which gives you an extra layer of safety and control over the water temperature. Consider installing thermostatic limiting valve like the Honeywell AM101C, to prevent scalding. A must have product for every water heater in your home. Smart Investment : Engineered to prevent scalding and Legionella bacteria. Available in multiple connection types. Teflon coating increases product life and resists mineral deposit build-up. HEALTH: Mixing valves help to prevent bacteria growth. If your water heater’s temperature is set too low, deadly Legionella bacteria can grow. The mixing valve allows you to set your water heater at a high enough temperature to destroy bacteria and not be scalding hot. You control the balance. SAFETY: Burns can occur quickly, but this mixing valve helps prevent scalding. Honeywell mixing valves meet the strictest safety standards in the industry when following their guidelines. COMFORT: Enjoy more available hot water. The mixing action of this valve can give you up to a 60-gallon performance from a 40-gallon tank – it’s like adding a larger water heater without taking up the space. How Mixing Valves Work: Cold water is mixed with hot water to provide safety and comfort at the faucet. A Honeywell mixing valve allows you to set your water heater to a higher temperature to reduce the threat of bacteria growth, yet the mixing action helps prevent scalding. Plus, you’ll increase your available hot water supply by mixing hot water with cold. Get the Peace of Mind that Comes from Improved Safety, Health and Comfort with a Honeywell Thermostatic Mixing Valve.